To know there is a way to help your children, potentially even save their life but you do not have enough money to do it, it's a desperation you can't put into words. Please join our fight by helping make a difference in this extremely rare and devastating disease, Schimke Immuno-Osseous Dysplasia (SIOD). 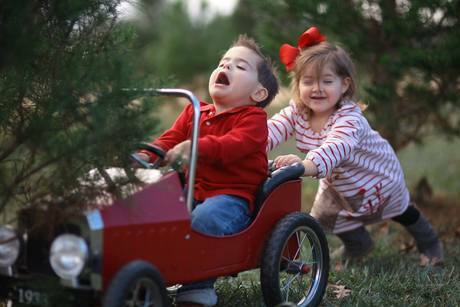 Our children Kruz and Paizlee, are the first siblings in USA with rarest type of dwarfism. It is also a fatal disease with no cure. Life expectancy is not past 10 years old. To be able to save our children & the other SIOD babies, we have to send $30,000 monthly to keep salaries and supplies funded and continue working towards a cure or treatment. We've sent over a half a million Stanford to begin research, but it's barley scratching the surface. 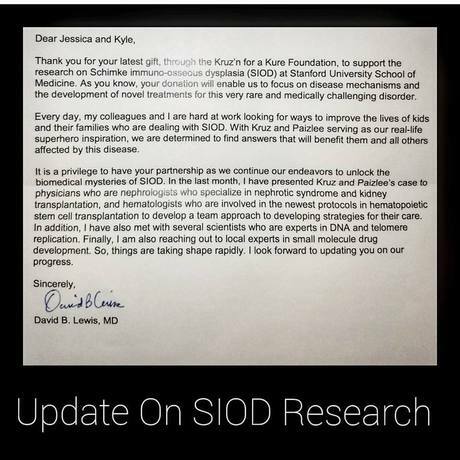 We have a fund set up there specifically for SIOD research. This will be groundbreaking research and open doors to unmarked territory. We are ready to make a difference! If we don't do something fast, symptoms will continue and once they start they do not stop. Swelling, back pain, severe migraines, nephrotic syndrome, extremely weak immune system and high blood pressure. Usually resulting in kidney failure, bone marrow transplant, hip replacements, stroke, chance of cancer, memory loss, skeletal dysplasia problems; until their small bodies will not be able to take it anymore. They are happy & pain free right now, we enjoying every single day. Being little is the least of our worries. With this rare-genetic disease, Kyle and I had a 1 in 3 million chance of being carriers of this particular gene. Kruz and Paizlee each had a 25% chance to even receive both copies. Well, both of our children received BOTH mutated copies causing this disease to go active. In better words, they have "lost their instruction map" for this genes function, causing nothing but pure destruction inside their body. Researchers have the resources and technology, we simply need your help with the funding in time. Your 2017 contribution has done remarkable things for Kruzn For A Kure Foundation. We are so grateful and hope you have a blessed New year. Thank you for supporting Kruz & Paizlee. Today, January 2nd we are launching Paizlee's 2nd Birthday campaign! What better gift to give than offering hope for another birthday. 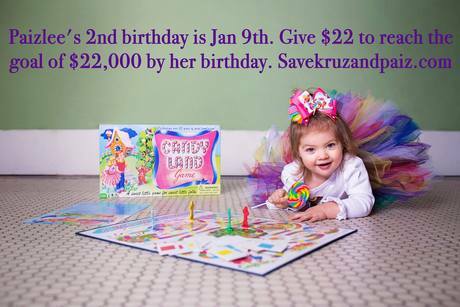 Give $22 to help reach the goal of $22,000 by her birthday on January 9th! That's 1,000 people willing to take part and participate, will you help give the best gift of all, a chance at life? 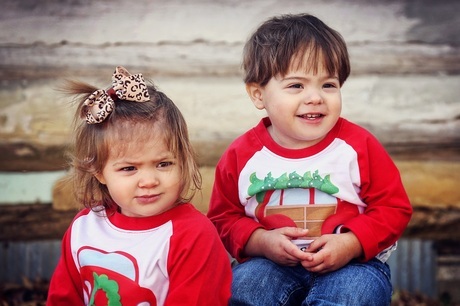 #give22 #paizleespurpose Thank you for those who already gave to Paizlee's 2nd Birthday campaign! God bless your family Prayers that they can get the help needed!!!! Prayers for healing!! Lisa Stults1 year ago Best wishes. Mary Morsilli1 year ago Best wishes. Ashley Himber1 year ago Best wishes and keep inn kruz N!! Charles Price Vaughan IV1 year ago Best wishes.